Kyle Grillot - kgrillot@shawmedia.com Volunteer Jessica Silva, 17, (left) reads off bingo numbers to residents like Eleanor Cairns (center) with the help of Justine Cusack, 16, at Fox Point McHenry Assisted Living Saturday, January 31, 2015 in McHenry. An AP poll found young people under 30 are more apt to give back than their parents were. Silva and Cusack are art of the Key Club of McHenry High School volunteers throughout the year at numerous organizations. 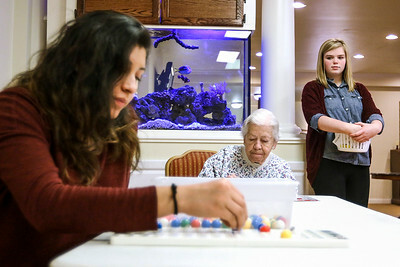 Volunteer Jessica Silva, 17, (left) reads off bingo numbers to residents like Eleanor Cairns (center) with the help of Justine Cusack, 16, at Fox Point McHenry Assisted Living Saturday, January 31, 2015 in McHenry. An AP poll found young people under 30 are more apt to give back than their parents were. Silva and Cusack are art of the Key Club of McHenry High School volunteers throughout the year at numerous organizations.